Atlanta-based Delta was founded in 1924 as the Huff Daland Dusters crop-dusting operation in Macon, Ga. The company moved its headquarters to Monroe, La., a year later. Its fleet of 18 Huff-Daland Duster Petrel 31 planes is the largest privately owned fleet in the world, flying south to Florida, north to Arkansas and west to California and Mexico. In 1927, Huff Daland began offering its services in Peru and operated the first international mail and passenger route on the west coast of South America (Lima to Paita and Talara) for Pan Am subsidiary Peruvian Airways in 1928. That same year, C. E. Woolman bought Huff Daland Dusters and renamed the company Delta Air Service to honor the Mississippi Delta region it served. In 1929, Delta operated its first passenger flights over route stretching from Dallas, Texas to Jackson, Miss., via Shreveport and Monroe, La., using a Travel Air S-6000B planes, which carry five passengers and a pilot. In the 1930s, the airline started service out of Atlanta, changed its name to Delta Air Lines, and stepped up its passenger service offerings. In the 1940s, it moved its headquarters to Atlanta, put air stewardesses aboard its Douglas DC-2 and DC-3 flights, started flying cargo and started offering coach class between Chicago and Miami. The 1950s saw Delta create the hub-and-spoke system, where passengers are brought to a hub airport and transferred to their final destinations. It also unveiled the iconic Widget logo and launched DC-8 jet service. In the 1960s, Delta launched Convair 880 and DC-9 jet service, flew the first flight connecting Atlanta and Los Angeles and activated the electronic SABRE reservations system. Delta launched Boeing 747 service in the 1970s. It also merged with Northeast Airlines, introduced Lockheed L-1011 jet flights and began flying between Atlanta and London. And in 1979, the carrier celebrated its 50th anniversary. In the 1980s, the airline launched the frequent flyer program that would become Sky Miles, watched its employees raise $30 million to buy a Boeing 767 dubbed "The Spirit of Delta" and merged with Western Airlines. In the 1990s, it bought Pan Am's trans-Atlantic routes and the Pan Am Shuttle, unveiled its website and expanded into Latin America. In the 2000s, it acquired Northwest Airlines, filed for Chapter 11 bankruptcy protection and added flights to 124 new nonstop routes and 41 destinations. 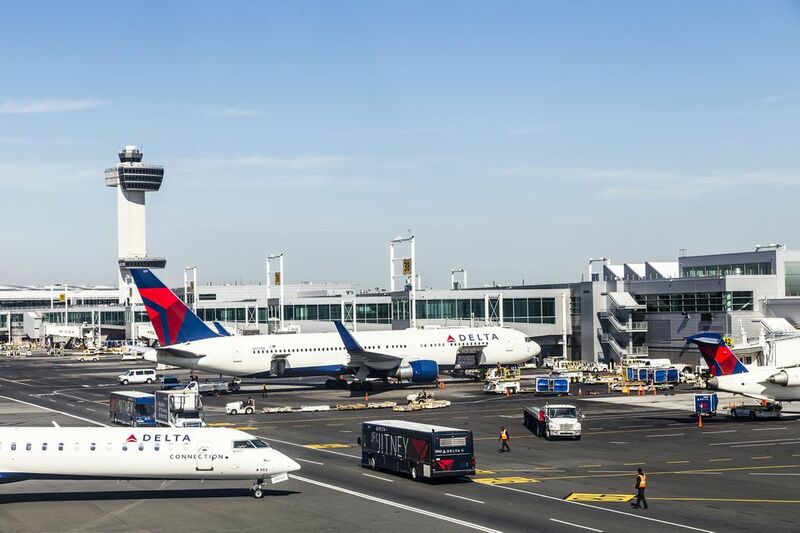 Delta and its Delta Connection carriers offer service to 323 destinations in 57 countries on six continents and operates a mainline fleet of more than 800 aircraft. The airline is a founding member of the SkyTeam global alliance. Delta and its alliance partners offer travelers more than 15,000 daily flights in key hubs and markets including Amsterdam, Atlanta, Boston, Detroit, Los Angeles, Minneapolis/St. Paul, New York-JFK and LaGuardia, London Heathrow, Paris-Charles de Gaulle, Salt Lake City, Seattle and Tokyo-Narita. Delta was founded in Monroe, Louisiana. Its corporate headquarters has been located at Hartsfield-Jackson Atlanta International Airport since 1941. Delta has a robust website with information for customers including ​booking trips, cars, hotels and vacation packages; look at flight status; check-in for boarding passes and luggage tags; the SkyMiles frequent flyer program; fare sales; weather advisories; the airline's ground and inflight experience; the Sky Club; the airline's credit card; contract of carriage; and news. Need to find your seat, figure out how much space you have for carry-ons? Delta Air Lines lets you see the dimensions, seat numbers and maps, entertainment options, and much more on their fleet of aircraft, here. Do you have to speak with someone in Delta, call in a reservation, or claim a refund? Here you will find a directory with Delta Air Lines phone numbers. Join Skymiles, manage your account, and learn how to earn, use and transfer miles here. Get more details about the SkyTeam Alliance here. Delta's deadliest crash occurred on August 2, 1985. The flight took off from Fort Lauderdale and crashed at Dallas-Fort Worth International Airport, killing 133 passengers and crew on board. Thirty four passengers survived. The story of the crash was later turned into a television movie, and many changes were made to pilot wind shear training, weather forecasting, and wind shear detection. For the latest Delta Air Lines news alerts in different languages, check out its news hub. A Delta Air Lines flight from from Gulfport-Biloxi to Hartsfield-Jackson on December 28, 2015, carried the 100 millionth passenger to arrive at the airport, a record for any airport in the world. The carrier also has the largest in-house meteorology team -- 25 strong -- in the world. These meteorologists provide comprehensive, detailed forecasts that help the airline make decisions that affect operation of the global fleet. In the First of a Two-Part Series, We Look at Boeing's Original Jets.